No more light! The only thing I can take pictures of this time of year is lightbulbs. I should have something to show in a few months. What is it with you and sunlight? Ever heard of... artificial lighting? My award.. losing photo was taken at night. snoopy wrote: ↑ no more resurrections? 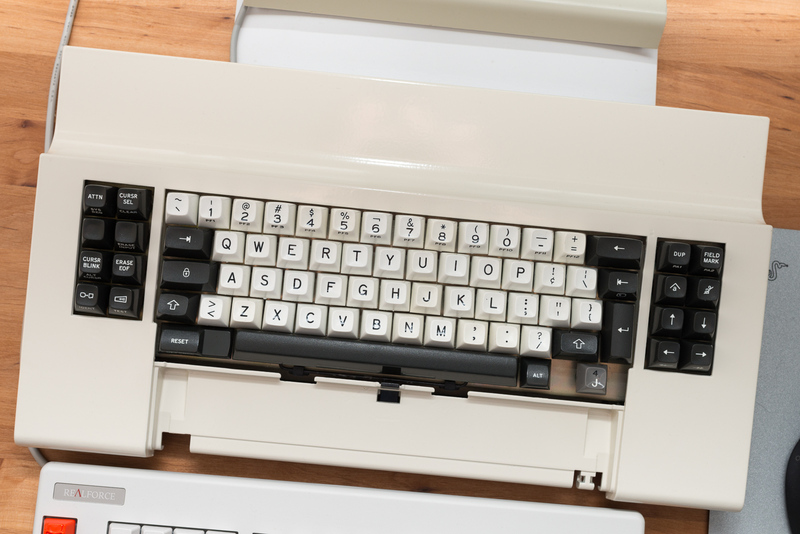 What is so special about a Kishy, Model F? cookie wrote: ↑ What is so special about a Kishy, Model F? Probably also the weight / size ratio! For that size it is very, very heavy and feels therefor super sturdy! Today i started to resurrect my beamspring! It seems to be in good condition, no rust as far as i see. 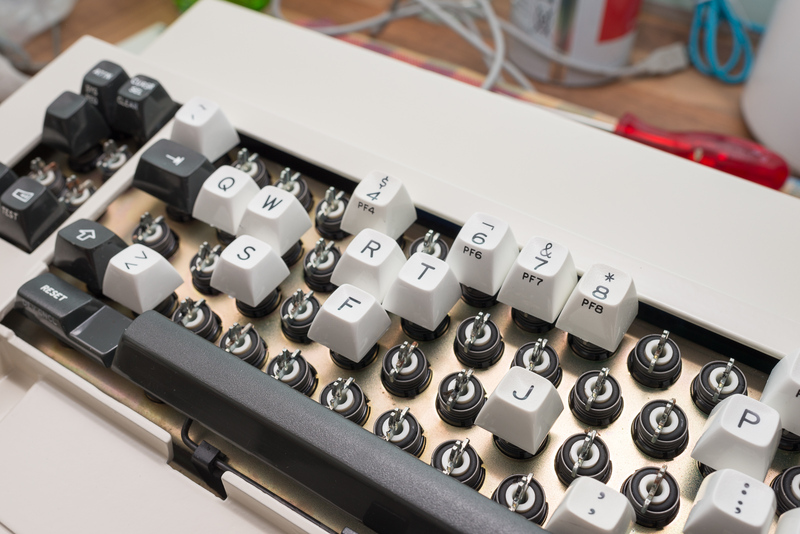 One problem is that one key is missing, and my plan is A) to get another beamspring or B) make a 3D printed or CNCed keycap or C) someone has a spare - which is probably the most unrealistic option. I don't have a spare key of the correct size, but I do have loads of new 1U tripleshot J/4 keys. Want one to fill the gap temporarily, Madhias? I have the German version of this board and it's really sublime. Such a solid board. @scottc: Where did you get those keycaps from? Could you post a photo of them? Not that I need one, I don't even have a Beamspring, just out of interest. Cindy sent them to me with my first SSK from her. Apparently they're a load of spares from some other IBM machine. I don't remember which one. Can't resist to show the progress so far! There are some more things to do, so far everything's working. I forgot to plugin the solenoid, stupid me, and the front "door" is not fixed because there is missing one part of the door mount on the left side, which broke of. The case is now powder-coated - without the barrier between the caps on the left and on the right! Unfortunately the case was not really in a good shape, and the 'wall' on the right side had a missing part, and was bent. I tried to fix it, but it was not that good. Wow, looking great Madhias! That board looks so pristine. Did you have to do much work for the restoration? You're very welcome for the cap. Madhias wrote: ↑ Can't resist to show the progress so far! Thank you for giving in. What a beauty! scottc wrote: ↑ Wow, looking great Madhias! That board looks so pristine. Did you have to do much work for the restoration? You're very welcome for the cap. The interior is in really good condition, no rust on the steel plate, only a little bit on the stems for caps. 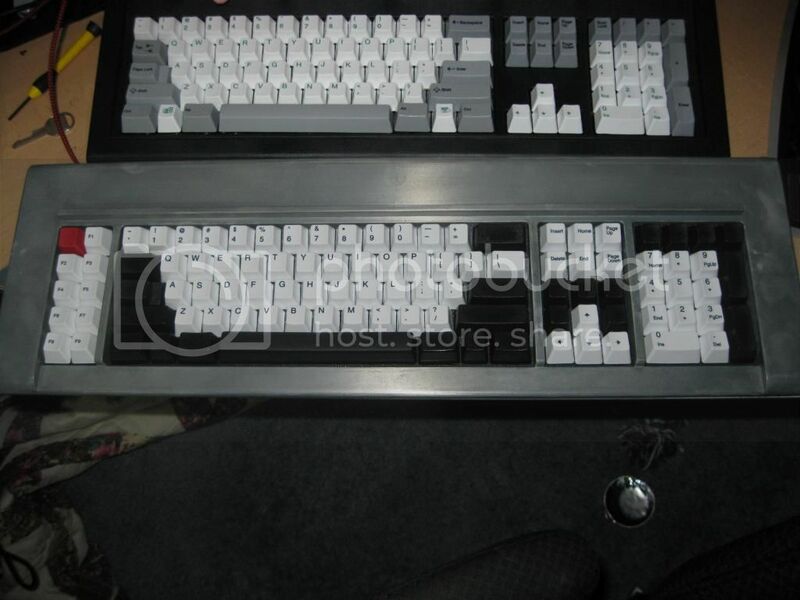 The top case is cleaned with sandblasting and afterwards powder-coated with some beige RAL color. It's a glossy finish, unfortunately no structure because the colors with structure just did not fit. It cost €78, by the way, at a local company. Excellent, really nice. I hadn't really considered re-painting mine but it's in nowhere as good condition as yours. Is it dirty or rusty or damaged? Quite rusty on the inside, and the exterior has lots of flaky and broken paint. Unfortunately, some of the keys had old stickers on them that the adhesive wouldn't completely come off of. Still, it has its character, I don't mind. Such an excellent keyboard! Main mouse: What's a mouse for? Can't ever post enough pictures lol. Who is using a Beamspring daily? How are your (kind of longtime) experience? And we need more pics. 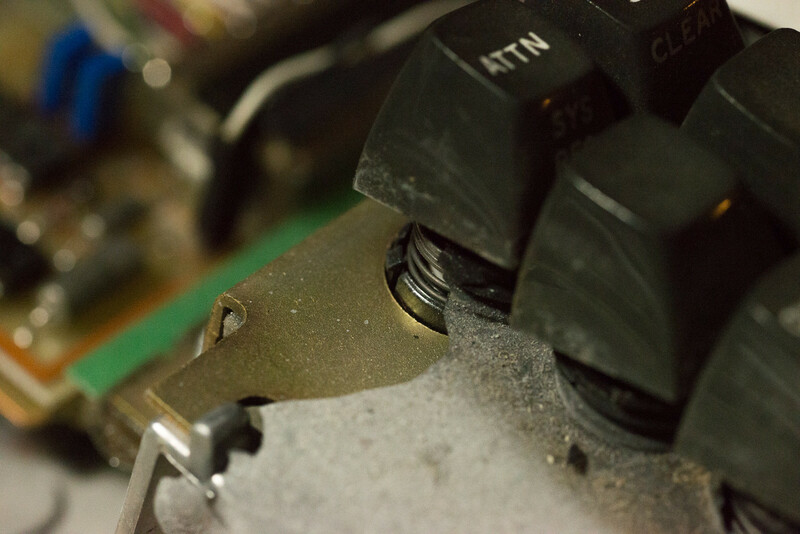 Please post pics of Beamspring/4704/... on your desk. Resurrect it! You'll thank yourself later. Getting an xwhatsit Beam Spring board is a little pricey still so I may hack my own solution with an edge connector. I need to get better pictures of mine, or at least current. I have changed out a few caps. is it just the pic or is it bent? snoopy wrote: ↑ Who is using a Beamspring daily? How are your (kind of longtime) experience? 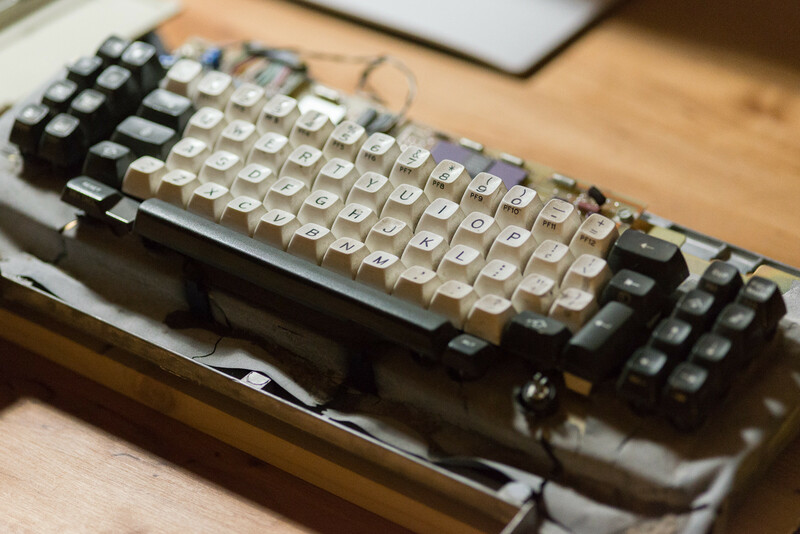 I start feeling carpal tunnel syndrome symptoms when I use a Model F or any other keyboard that isn't a beamspring (or 7-row Thinkpad keyboard). 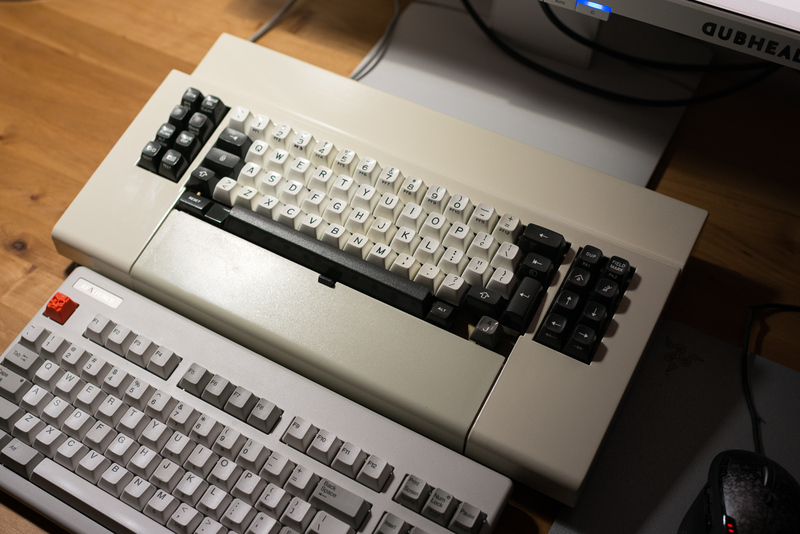 This may however just be keyboard Stockholm syndrome (my 3727 is large, heavy and threatening). snoopy wrote: ↑ is it just the pic or is it bent? Please ignore the messy desk. For reference all my monitors are 23 inches.